The development of Broken Age by Double Fine marked the return of Tim Schafer as an adventure game designer after 15 years. Many know of it’s astonishingly positive Kickstarter campaign, maybe not as much know of the perils and struggles of the team that lead to decisions that not everybody ended up liking. 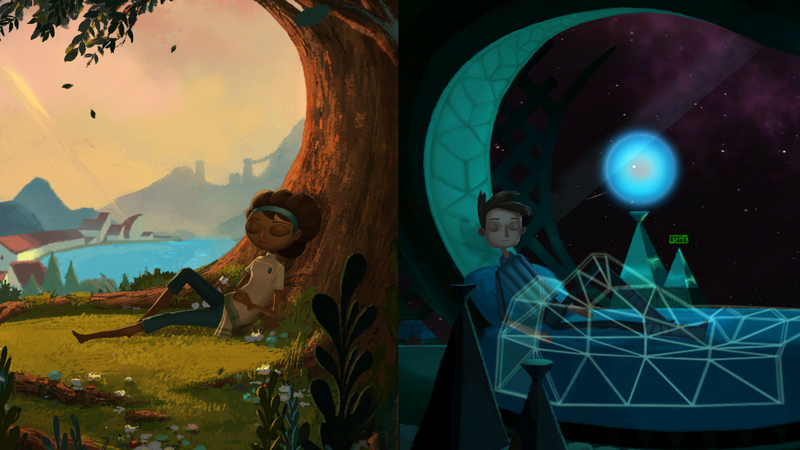 Still, Broken Age to me is like a great fable. I’ve enjoyed most of it and when I started analyzing its puzzles I couldn’t help but be amazed at how everything seemed to be designed to be in the right place. When I began writing down its Puzzle Dependency Chart, Broken Age appeared to me as a strange, subtle, yet very clever representation of the “harmony of the opposites” and, amazingly, this is something extremely noticeable also in the game’s flow. Just by overlooking at it, without being able to distinguish the different elements, you can easily figure out how it seems to be structured. To reflect their main colors, I’ve used the Carnation Pink elements relatively to Vella’s storyline and the Columbia Blue ones relatively to Shay’s. Of course I’ve used this website to identify the right colors’ name, I would have probably just said “pink and blue”. The first “row” of this chart displays the puzzles for Act 1, while the other two rows are related to Act 2. In Act 1, the two storylines are completely independent from each other. This, basically, lets you switch anytime between the two characters – as long as neither of the two storylines is complete – only driven by curiosity or by the feel to “need a change”. That is, there is no actual gameplay reason why you should do that. On the contrary, in Act 2 there are some elements that involve switching between characters in order to solve some puzzles, especially in the very last bit, where Vella and Shay have to coordinate towards the end of the game. While playing the whole game I couldn’t help but notice how the mood follows the changes in puzzle structure. I’ll try to explain what I mean. Vella’s storyline in Act 1 is pretty easy and straightforward to play through. Sugar Bunting represents a cakewalk (pun intended) that makes the player understand how the game works, how talking to other characters may reveal crucial and provides most of the backstory in the first 30 minutes, which I think is a great thing. After Vella first escapes Mog Chotra, she finds herself on the cloud city of Meriloft. Here, the player has to put to practice all the “teachings” learned in the previous segment, plus has to experiment some inventory item combinations. More than once, the way to obtain a specific item is to ask people. As I said, talking to other characters is crucial. The other good thing about this is that it’s also a great way to understand more about the characters and the world they live in. The whole Act 1 – especially Vella’s storyline – has this dream-like, somewhat epic mood. Everything seems possible, even defeating a horrible monster such as Mog Chotra. Of course you have to prepare for that thing to happen: some traveling, some people to know and some things to do. But every epic tale has this kind of stuff, am I right? When playing with Shay, the player has a limited number of areas to explore. Even by the end of his storyline for Act 1, there are not many additional areas. Therefore, the gameplay is spiced up with some mini-games and slightly tougher puzzles. This confined space in which Shay moves in really helped me understand his feelings of imprisonment and boredom that come right away from the attentions received from his Computer-Mom, which doesn’t seem to realize (or believe) that Shay is not a baby anymore. To get “out of the loop” we have to learn to play by the rules and then break them. Only then, Shay’s “real” adventure will start, meeting Marek and beginning his “rescue missions”. Still, that dream-like mood doesn’t disappear entirely, even if it feels broken in many ways, compared to the one you feel when playing Vella’s storyline. The end of the first act represents the real pivotal moment of the game, both in narration and puzzle logic. All we thought was true turned out to be, more or less, a lie. Most of that dream-like mood falls out, as the second act unravels around the search for truth about what is really going on. A big moment is when both Shay’s mom and dad reveal themselves to be real, something that Shay seemed to have forgotten for a long time. So, Act 2 feels far less “easy”. There are not many new areas for you to discover, as Shay will basically walk through all the places that Vella visited before and Vella will walk through the partially destroyed rooms of the Bassinostra. That’s probably why, instead of having puzzles that involve talking and interacting in specific ways with the environment, now the game forces you to rack your brains. It’s not only matter of using the right item in the right place anymore. In what it seems to be feeding the game’s symmetric structure, in Act 2, both Vella and Shay “need each other” to solve at least one puzzle right before the final segment of the game, where they will have to actually cooperate. Also, both of them have to repeat something that the other did in the previous Act, in order to solve a puzzle, as if they were now somewhat linked. Pretty straightforwardly, Shay’s main task in Act 2 is to find what Alex needs in order to fix his ship. This leads you to solve 5 different and almost unrelated puzzles. This leaves you with a nice degree of freedom to jump between different puzzles, which is something always welcome in adventure games. Here Double Fine did a pretty good job, in my opinion. The two big puzzles in this section of the game are the one that involves getting F’ther to untie the knot, which had me helplessly hoping for a Gordian way to solve it, and the one about re-wiring your Hexipal friend. The Hexagonal element you see in the image above represents a “duplicate” puzzle: in Act 1, Vella had to make the tree puke to get his sap, here Shay has to do the same. Back on the Bassinostra, Vella has a hard time walking around the partially destroyed ship (even if she’s kinda proud about the mess she made with the death ray). Now it’s Vella’s turn to have a linear branch of puzzles to face. What makes it different from the Shay’s storyline in the previous act is that the mini-games are now replaced by real puzzles, as if the ship, originally built to be hassle-free and problem-free, is not able to provide the same “safety” anymore. Also, there is more focus on secondary “characters” such as Dutch the knife, the spoon and the fork, which made me laugh most of the times. I find the puzzle that leads you to meet Hope (Shay’s mom) to be nice and interesting because, while having you to match pieces of information together, lets Vella know more about Shay so that, even without talking with him or with his mom, she changes her opinions about him being a bad guy and feels more connected. Very subtle and sweet, in my opinion. Here there are three “duplicate” puzzles: tricking the teleporters into getting your head bigger; wearing the cloudshoes and knitting the “previous destination” onto the Space Weaver’s fabric. Then the very last section of the game, wraps everything back together. Vella and Shay now have to work simultaneously to cause the Mogs to meltdown. Other than the ending, not very much else happens here, except that you get to know Alex a little more, by looking at how his and Shay’s childhood were similar, being both linked to the Project Dandelion. Storywise, both Vella and Shay adolescences were broken, obscured by false myths and lies. What makes them heroes is that they both noticed that and wanted and managed to make their way out of that, no matter what. Like for any proper fable, there is not much use in analyzing the whys of evil, when the success of the good brings so much satisfaction to the plot. That’s why I’m not complaining much about those which I consider to be “plot holes”: once you have learned the moral, you probably won’t ask too many questions to the fable itself. When I said that this game makes me think of the “harmony of the opposites”, it was because the first Act is a dream-like epic cakewalk, while the second one looks like a breaking of this spell. I found the puzzle placement to be extremely supportive to this harmony. Almost all the time, things felt like they were placed to create some sort of balance. No matter how hard they could have been, none of the puzzles felt bad or particularly unfair to me. Well, probably trying to guess what the knot figures looked like in a dialog tree was not the best, but at least it was fun. I was more “puzzled” (pun intended) by the fact that I had to be sure to avoid skipping dialogs before going back and forth to ask Carol for another diagram, but that was just me getting impatiently lazy. As per the Hexipal wiring puzzles, well, there’s no harm in taking notes down as you play. I mean, it’s an adventure game, not a fast-paced first person shooter (which I enjoy as well). It made me think that back when the Kickstarter launched, everyone was weeping with joy at the idea of an old-school adventure game. Well, these kind of puzzles have always been there in most of the adventure games by Schafer. Think about some of the puzzle Full Throttle or Grim Fandango have. In hindsight most of us loved them even if we were frustrated by solving them the first time. Sure enough we didn’t forget them as time went by, like I won’t forget this game.